Umm… rosewater? SOLD. Literally, my exact reaction when I stumbled across this recipe on Pinterest the other day. The beautiful ombré of muddled of blackberries resting beneath a billowing cloud of créme de coconut was the most visually beautiful cocktail I’ve seen in quite awhile. Needless to say, this jewel hued gin sip did not disappoint. In fact, I made it twice to style and photograph it two different ways… because... well… I mean, duhhh. 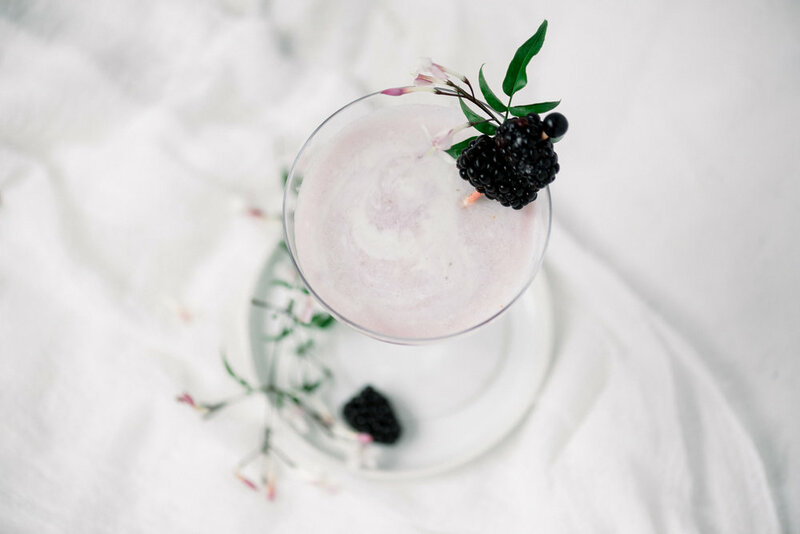 Take a peek at this easy, tasty, and oh-so-beautiful gin recipe below that’s sure to wow your guests. Muddle one blackberry in the bottom of a rocks glass, then top with crushed ice. Shake all remaining ingredients in a cocktail shaker with ice for 5 seconds only. Pour over the crushed ice, give it a light stir, then top with more crushed ice and blackberries. It's easiest to drink this one with a straw (I have small metal ones, but you can also cut paper ones in half).